Why do I love Christmas Cactus? Christmas Cacti and hummingbirds were two of nature’s blessings that excited my mother. After my father died she moved to the second floor of an assisted living. It was an adjustment for her. With no trees, she missed her yard with places for hanging hummingbird feeders and their spring and summer”fly-bys”. Her Christmas cacti did find a loving home, and she moved them around in her apartment until she found just the right amount of sun and shade. Every year, around this time, she would proudly show me their bright-colored blooms. Albert and I are blessed to live in Colorado where the hummingbirds show up every Mother’s Day and swarm the feeders until October. I love to see the first ones because their arrival is like a message from my Mom! This year, we had one straggler that did not want to fly to warmer ground. We had to force him/her to leave by taking down the feeder. The birds fly south and many follow the Texas coast into Mexico. Reading our newspaper last week, I read an article titled, “Thanksgiving Cacti Are Wonderful Holiday Plants”, written by Linda Corwine McIntosh. It caught my eye because I had never heard of Thanksgiving cacti! 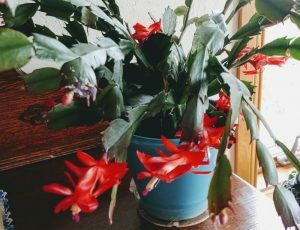 Christmas and Thanksgiving cacti are different species (Christmas cactus is Schlumbergera Buckleyi and Thanksgiving cactus is Schlumbergera Buckleyi). There is even an Easter cactus — Rhipsalidopsis gaertneri. So, which do I have? You can tell by looking at the shape of the leaf segments. On a Thanksgiving cactus, the segments have 2-4 saw-toothed or pointy projections. The Christmas species has rounder, smoother leaves. Now I know why my cactus blooms earlier than Christmas! Thanksgiving cacti bloom from September to January and have yellowish, salmon, fuchsia, and white flowers (or a combination). propagate them to give for Christmas gifts. Disclaimer: I am not a great caretaker…I barely remember to give mine water…never move them…don’t fertilize them…and they bloom anyway! I have never tried putting my cacti outdoors (especially with the cool nights here), but Linda says she puts her plants outdoors in a protected shady place during the summer. In May or June, you can pinch off the leaves all the way back to the place where they form a “Y” (this makes the plant bushier, more compact, and makes it easier for the plant to produce more flowers! Turn the plant as you pinch to give it a balanced shape. Both of my holiday cacti plants were Christmas gifts, so why not use the “trimmings” to create new plants to give as gifts? Pinch or cut off a section of stem with 3 to 5 stem segments. Water the potting soil, poke a small hole in it, place the stem in the hole and firm up the soil around it. You can also try rooting the cuttings in water. Since I am new to both methods, I plan on attempting both! WOW! I feel like I just gave my Mom a Christmas present by sharing this blog with you. Happy Thanksgiving and Merry Christmas, Mom! Please comment below if you love these plants as much as I do! Thanks, Judy, you definitely need one! Ok, you make me want to buy one of these beautiful plants! I already dearly love hummingbirds.